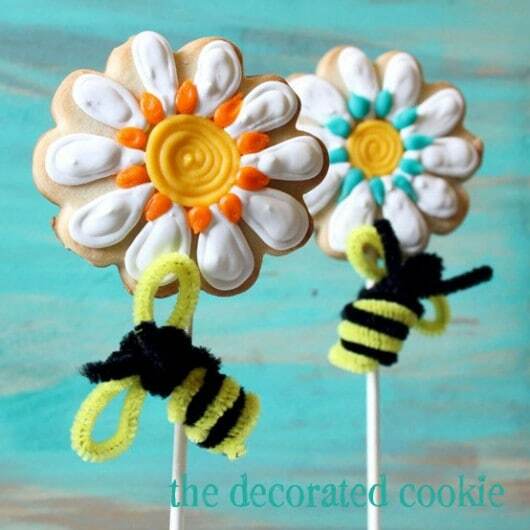 Daisy cookies: Decorate daisy cookie pops with cute pipe cleaner bees. 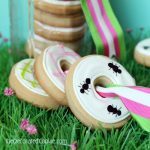 How to decorate daisy cookies with cute bumble bees, and a review of Amy Atlas’s Sweet Designs. You heard me mention Amy Atlas’s book last week… Well, today is the official launch date of Sweet Designs: Bake It, Craft It, Style It! I got my preview copy last week and fell instantly in love. This book is simply stunning, beautifully arranged and highly useful. From the introduction, Amy warmly welcomes us into her world with family tales of her childhood affinity for sweets. She deftly describes what she does: “Combining confection, crafts, and creative direction.” Her innovative approach changed how we see the dessert’s role in entertaining. Amy’s skillful weaving of personal story and practical how-tos to create awe-inspiring presentations renders the dessert table much greater than the sum of sweets. 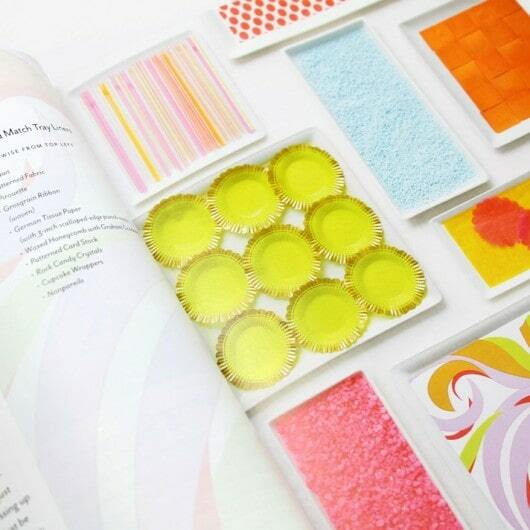 The first section, “Sweet Basics,” forms the building blocks of creative dessert tables so you can design your own. The section includes basic recipes–cakes, cookies, brownies, icing and more–and important techniques, such as flooding cookies with icing, frosting cakes, working with fondant, and assembling a tiered cake. 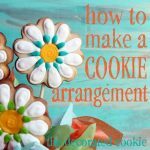 You’ll learn how to craft the table decorations and make your own packaging (for example, custom candy wrappers and bags, drink flags, and tags). The section also covers how to buy and use candy, and it provides practical advice on how to display your sweets, such as the high value of easy-to-make tray liners. 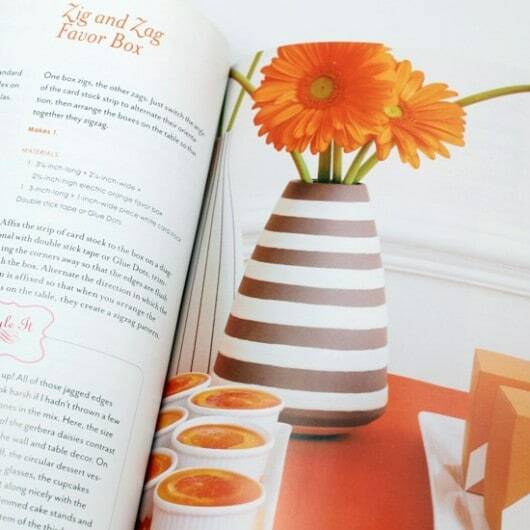 The book then presents 14 specific party themes in their entirety, with recipes for every dessert, resources for supplies, and instructions for the crafts involved. Further, each party opens with a quip, explanation and story that lends even more meaning to the intent and virtue of the theme. For example, a yellow and white table for Spring is inspired by Coco Chanel’s “elegance through simplicity and refinement.” Or a bright orange zigzag table derived from a cashmere scarf of long ago leads to meringue sandwiches, pleated pedestal skirts and rickracked ramekins. The colorful display of marshmallow dice, a candy checkerboard and domino streamers speaks to Amy’s game night with her family. I think I’ll have to try Vineyard Afternoon and the sangria on a stick. Photograph above by Johnny Miller. 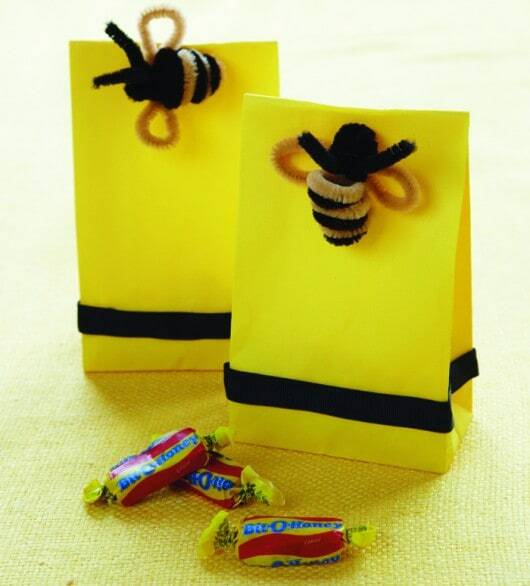 This bumble bee favor bag is part of the Honey, I Love You dessert table. You can find more amazing photos from this theme HERE at Amy’s blog. Honey, “oozy, gooey and drool-worthy delicious,” presents so many possibilities for a dessert table, as Amy notes, and brings to mind “bees, hives, combs, wax,” all wonderfully represented in this eye candy of a display. What I find so admirable about this book is that the perfection that is an Amy Atlas dessert table is made to feel attainable and doable. You can recreate the tables exactly as presented, mix and match, or simply use one little element. For example, I made pipe cleaner bees from the instructions on p. 184 using supplies in my daughter’s art bin. 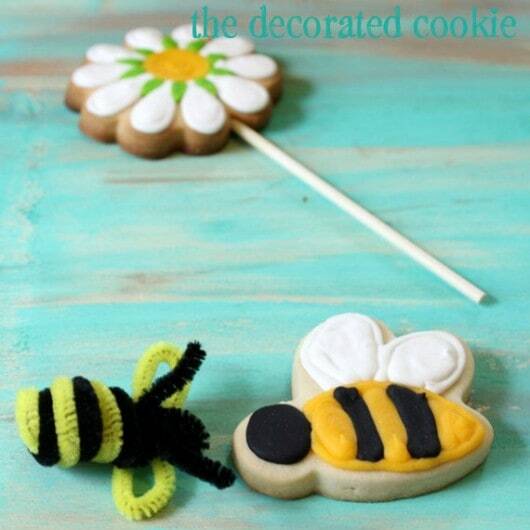 And I can now envision a field of daisy cookies with bees attached to the sticks. 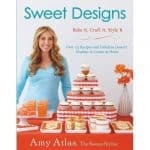 Amy’s book, Sweet Designs: Bake It, Craft It, Style It, is on the shelves TODAY!! Find it everywhere. 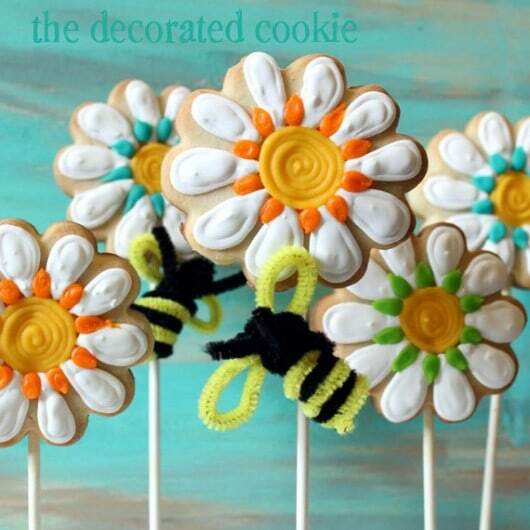 And by the way, to make daisy bee pops, I first made cookie pops with a daisy cutter. 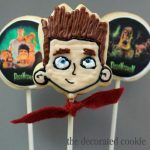 For tips on making cookie pops, click HERE. I then prepared my royal icing, divided and tinted white, yellow, turquoise, lime green and orange with my Americolor Soft Gel Pastes (Bright White, Egg Yellow, Turquoise, Electric Green and Orange). I piped a circle of yellow, then I outlined and piped to fill the petals in white. Between each petal I added a little squeeze-and-pull petal with a color of icing. For basic cookie decorating tips, click HERE. I attached Amy’s pipe cleaner bee to the sticks. Ah, to be Amy or Meaghan! You both are sooooo talented and creative. Thanks for sharing with the less creative masses….